Amid the wreckage, worker finds affirmation of faith. Article by CNN.com. Photographs by James R. Tourtellotte. 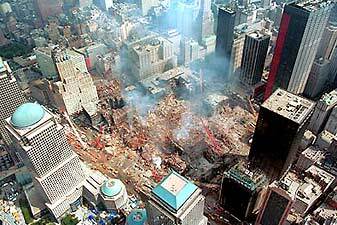 NEW YORK (CNN, October 4, 2001) - - Two nights after two hijacked jetliners slammed into the World Trade Center, causing it to collapse in a mound of twisted wreckage, Frank Silecchia had just helped remove three bodies from the rubble when he looked up and saw a scene he says transfixed him. 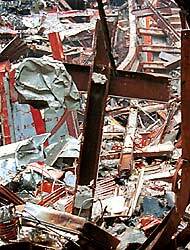 Among the debris from Tower One that had crashed onto the floor of the atrium of Building 6, the laborer with Local 731 said he saw steel beams strewn about in the shape of crosses that reminded him of depictions showing Jesus Christ and two thieves being crucifies on Calvary. "I seen this picture of Calvary with three, four crosses in it. The main structure of Christ's cross was in front of me. It took my breath away," said Silecchia. 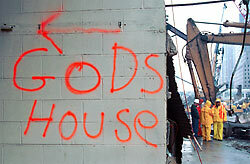 Since then, the crane operator has scrawled "God's house" on the building and shown his find to others at ground zero. "I've healed many people with this and brought contentment to them," the 47-year-old divorced father of two said. Among those to whom Silecchia showed the cross was Father Brian Jordan, a priest at St. Francis of Assisi parish in Midtown, who was offering communion to workers at the site. Jordan persuaded city authorities to pull the largest of the crosses from the wreckage intact and save it as a memorial. The cross will be removed from its resting place in the wreckage in a ceremony Thursday afternoon. "They'll have something to hang on the wall, and some inspiration," said Silecchia, who describes himself as a born-again Christian. "Our country is hurting right now, and I can't think of a better way to strengthen it - - through God's hands. It ain't a point of religion, it's a point of faith." "This country feels, in some way, God has forsaken them, and I don't want that to be happening," he said. Silecchia said the cross could help people of all beliefs. "Even an atheist watching this building must have said, 'Oh, my God!' 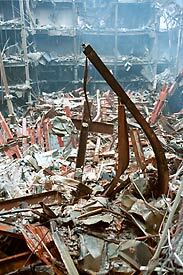 Evil did this work, and God prevailed to show his strength." The Brooklyn native, who lives in New Jersey, said he hopes his symbol of faith will inspire people outside the confines of ground zero: "It's healed so many people here; I'm just hoping it can do so for the nation." Thanks to George W. Gootee for providing me with the tip that lead to the creation of this web page.